It's a scary thing if you think about it. Last year, 19,000 rail cars filled with crude oil came through Oregon. Fortunately, none of them derailed, crashed, or exploded. But other places in North America haven't been so lucky. In 2013, 42 people were killed in Quebec when a train derailed. The explosion destroyed 30 buildings in the small town of Lac-Megantic. Trains have also derailed and exploded in North Dakota, Alabama, and Virginia -- sometimes sending up huge fireballs. There are good questions about whether these trains should be delivering oil at all -- and if they can be made safer. But one no-brainer is this: If an oil train is coming through your town, shouldn't local firefighters be notified in advance? Shouldn't local police be notified in advance? The only thing worse than an oil train derailment is an oil train derailment that happens when first responders are unavailable or unprepared. 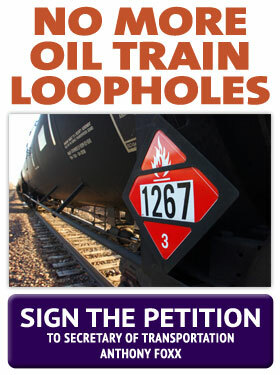 That's why BlueOregon Action has partnered with Senator Jeff Merkley, Senator Ron Wyden, and Congresswoman Suzanne Bonamici to call on the Department of Transportation to change its rules -- and require advance notice of oil trains to first responders. There's a lot to debate about oil trains. But notifying first responders? There should be no debate at all. Sign our petition and make your voice heard.